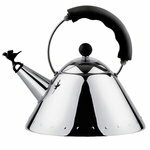 Alessi’s stylish 9093 kettle was designed by the American architect and designer Michael Graves in 1985. Today, the kettle is a design icon and one of Alessi’s most sought-after products. Graves’ kettle, influenced by art deco, pop art as well as cartoons, was designed to bring its users joy: the spout features a small bird that whistles when the water has reached boiling point. The kettle may also be used on induction hobs and its wide base makes the water heat up faster. Alessi’s classic is an excellent choice for cheering up the morning routine. The magnetic steel bottom is suitable for induction cooking.